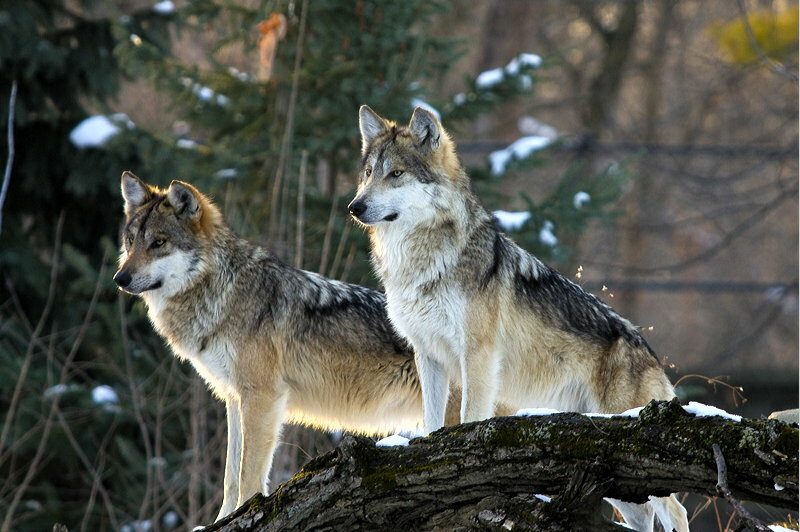 Currently, there are only 113 wolves and seven breeding pairs in the wild. With such a small population of wolves, it is critical that these wolves survive. The US Fish and Wildlife Service is actively working with ranchers and families who live in the Wolf Recovery Area to promote the longevity of the wolves and their importance to the ecosystem. 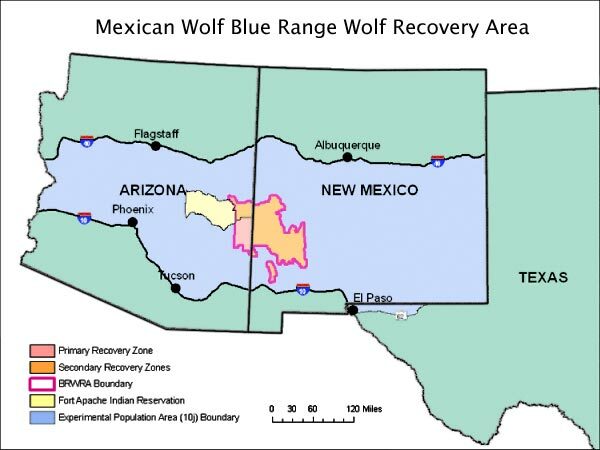 With these efforts, more Mexican wolves will have the chance to gain a strong foothold and increase their populations through new releases, higher numbers of breeding pairs, raised awareness, and reduce illegal shooting. As part of the delicate web of life, these wolves have a major impact in the health of their environment. Although wolves are great hunters, they are also scavengers and opportunistic feeders. Unfortunately, this has created concern among ranchers in the surrounding vicinity of the wolves. In 2008, a study looked into this concern, and showed that wolf diets consist of only 5% cattle. Because wolves are opportunistic in nature, they have been known to feed on livestock, which died of natural or unknown causes. Consequently, though only 5% in the wolf’s diet is from cattle, this study found that, overall, less than 1% of livestock losses are due to wolves; disease, natural deaths, weather, and accidents were found to be more common among cattle death. According to another study in 2011, black bears are responsible for the same amount of livestock calf depredations as wolves are; mountain Lions took the highest number of calves: 60% more than wolves. Though less frequent, wolves have been known to kill livestock. As a result, the US Fish and Wildlife Service has set up a fund to repay ranchers the appraised value for the loss of any cattle due to wolves. For years wolves have been regarded as fierce and dangerous creatures; ravenous beasts that stalked humans from the shadows. The reality is, wolves rarely attack humans. Wolves are at the bottom of the list of animals that have attacked humans. However, based on their successes as a top predator in the ecosystem, people still feel threatened by wolves. Extirpation campaigns at the turn of the 19th Century and into the 20th Century decimated wolf populations by the tens of thousands. During these times, massive hunts were carried out to eradicate the wolf from the landscape, and thousands of Mexican grays were killed. Their pelts could be seen hanging from many lodges and homesteads across the Southwestern United States. 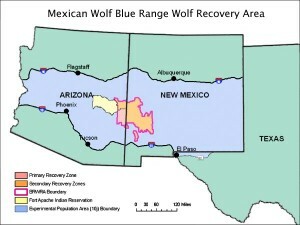 The Mexican gray wolf was effectively extinct in the Southwestern United States by the 1940s. The same actions were taking place in Mexico. Luckily, five wolves were captured in remote regions of the Mexican states of Durango and Chihuahua between 1977 and 1980, quite possibly the last remaining Mexican gray wolves in existence. These five wolves, essentially the last pack, were the beginnings of the Mexican gray wolves in existence today. The Captive Management and Breeding program has brought the wolf back from the very grasps of extinction and played an integral role in the reintroduction of the Mexican gray wolf. Holding Facilities across the United States and Mexico are part of the breeding program, which oversees the genetic survival of the species; known as the Species Survival Plan. Currently, in the wild there are three genetic lines of wolves that stem back to the original five that were captured during the 1970s. Inbreeding is a threat to the success of the recovery program, and new genetically strong wolves must be introduced to the current wild population to increase genetic diversity among wild wolves. The Captive breeding program is working hard to create this needed genetic diversity among the current Mexican wolf population, the descendents from the last pack.